A Swarovski Crystal set in our safe and nickel free setting, Medical Plastic. The 6mm measurement is the whole setting. 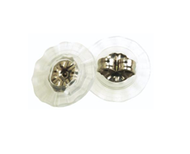 The skin friendly Medical Plastic setting will leave your ears happy, guaranteed! This nickel free earring is available in seven colors! Crystal, Rose, Sapphire, Aquamarine, Fuchsia, Turquoise, and Peridot. I really.love these. I myself am allergic to nickel and so when my little one was pierced I found a.physican who pierced with the blomdahl medical plastic studs. Kept her ears away from nickel for the first year. I went to order her daily earings but seeing that she was just a baby we needed earrings with backings that she could not pull off. These were not available at the time. I then looked to see what was availble.now and we ordered these. She loves them as do I. I had got her titanium earrings from a local jeweler and they seem to bother her and she wants them out within seconds to no more than 30 minutes. Usually within 5 seconds she starts complaining regarding any earing and for me.to take them out but with these she dis initially ask but agreed to give them a go and has now kept wearing these for about a week. No more complaints either. I asked her how they were and she said "Great". We will now be ordering more for both of us. These were larger than I expected and look very nice. Family that have seen them have given many compliments on them and inquired about them as well. My daughter has sensitive skin and wears the medical plastic earrings without any irritation! They are adorable on her and are still sparkly after months of wear!! I havent been able to wear earrings in about 20 years due to becoming allergic to metals that were even nickel free which i had always been able to wear. I have always had issues with piercings. I remembered wearing plastic earrings as a small child that caused no problems, but i was under the impression they were now discontinued. I decided to do a google search for plastic post earrings and these came up. So glad i bought these! They are very cute and dont look like plastic earrings! Being i hadnt had an earring in in over 20 years i did have to help the rings through (my holes never closed) i have been spinning them like a fresh piercing and after the first day had no tenderness. Usually they would get red, swollen and almost infected like. Nothing like this has happened! Will def buy diff colors and styles! Love love love these! I like my new earrings.